The beauty of this feature is that if I screw something up, or if for example a I configure Port security and there’s and error it will shut down the port so that horrible things like loops or security violations are not allowed. By default Err-disable will shut down the port and it will take a manual shut/no shut of the port. to get more information just from that port. This command will report back to you any recovery options that have been set, and the default recovery value of 300 seconds. This command will show you if we are detecting this error. By default all should be detecting. This will effectively enable recovery only for BPDUguard, and will change ALL recovery times to 60 seconds. 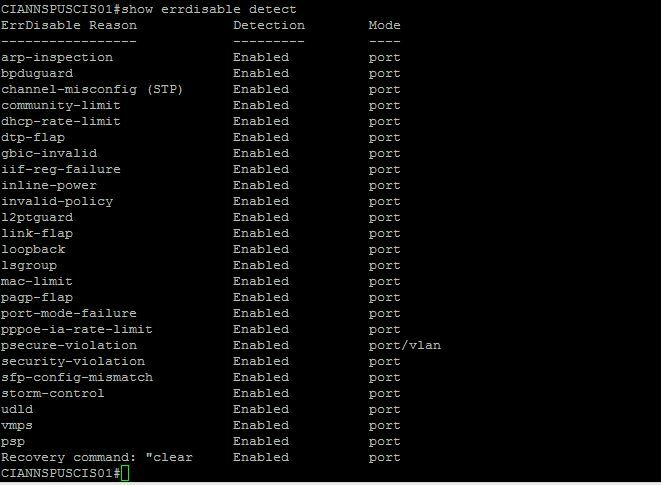 Errdisable is a great feature that Cisco implements in almost all of their switches. It can really save some pain if you incorrectly configure a etherchannel, or have a bad cable that is really sending a ton of CRCs.